Considering the growing demand in the market, we provide a qualitative range of Woven Wire Mesh at reasonable rates in the market. 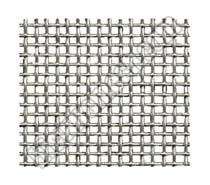 We are counted amongst the major manufacturers, exporters and suppliers of Woven Wire Mesh, and we have a team of workers who work hard to manufacture the mesh using approved raw materials and sophisticated machinery. While the Woven Wire Mesh is available in different specifications, we make sure that the mesh is safe to use, and promises long shelf life. We are based in Varanasi, Uttar Pradesh, India. Description : Wiremesh can offer wide-ranging characteristics depending on the configuration of wire thickness in relation to the aperture size, as well as type of weave. It can vary in texture from being as fine as silk to being as rigid as steel plate. With skillful and experienced technicians and engineers, we have been striving to update equipment, perfect our craftsmanship to meet the demands of the international market. We can customize wire mesh products according to customers' specific requirements. We produce woven wire cloth and woven wire mesh in a variety of weaving patterns, Typical patterns include Plain Weave, Twill Weave, Dutch Plain Weave, Dutch Twill Weave, Dutch Reverse Weave, Five-heddle Weave etc. We also design some special weaving patterns to meet customers actual requirements.